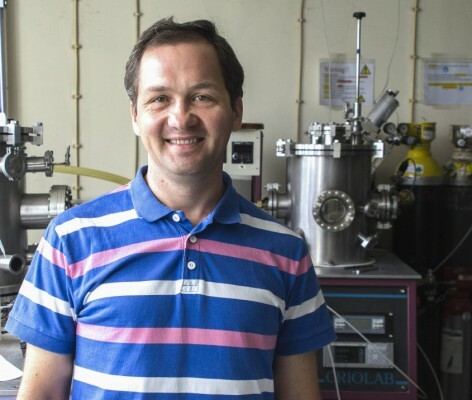 Alexander Tkach, CICECO Researcher, University of Aveiro (UA), has developed a technique to study distinctly and temporal unprecedented precision the effect of giant magnetoresistance (GMR), a phenomenon present in the hard disks reading mechanism of and magnetic sensors. The research developed in collaboration with the Max Planck Institute for Polymer Research, the Institut für Physik Johannes Gutenberg-Universität Mainz, the Sensitec GmbH, Fakultät für Physik - Universität Bielefeld and the Fritz Haber Institute of the Max Planck Society has just been published in Nature Physics, one of the most important scientific journals in the world dedicated to physics. The technology of spintronics, that uses and manipulates not only the electrical load, but also the spin (i.e. the magnetic moment) of electrons to process information, is present in devices used in hard-disk reading and industrial magnetic or biomedical sensors. This finding arose based on the discovery of the giant magnetoresistance effect (GMR) in nano-structured metals on magnetic and non-magnetic layers, which was honored in 2007 with the Nobel Prize on Physics awarded to Albert Fert and Peter Grunberg. This effect consists in a significant variation in the electrical resistance with the application of a magnetic field, which changes the relative orientation of the magnetization of the magnetic layers. The microscopic processes of electron scattering and thus, the electrical resistance of the materials where they move, are understood with models initially developed by Nevil Mott. However, the fact of the times involved are extremely short, less than 100 femtoseconds (1 fs = 10-15 s) posed a huge challenge to its observation and direct research, now made possible by the findings published in Nature Physics. The research team that Alexander Tkach was part, used at the University of Mainz, ultra-fast techniques Terahertz spectroscopy. Might as well study clearly and with unprecedented temporal precision the GMR phenomenon in magnetic multilayers, managing to separate and quantify the contributions of the two electron spin orientations on the microscopic phenomena involved in. But the importance of the work expands, with the demonstrated capability to modulate and modify Terahertz frequency electromagnetic waves with this magnetic phenomenon. The paper in Nature Physics can be viewed here.